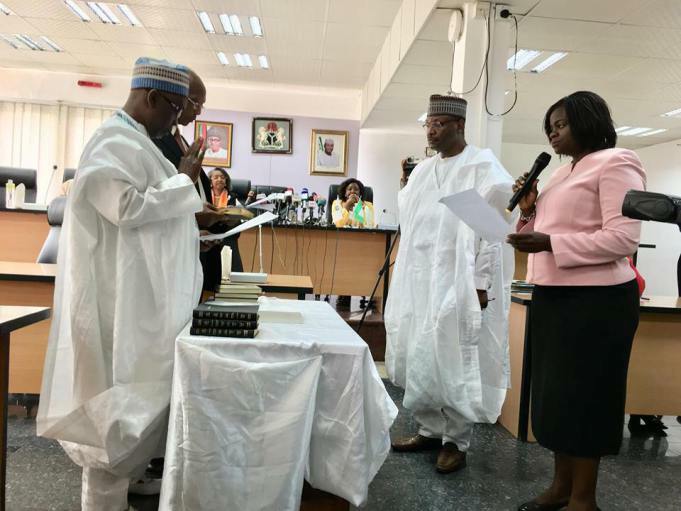 Seven Resident Electoral Commissioners (RECs) were today sworn in at the Independent National Electoral Commission’s (INEC) headquarters in Abuja, the Federal Capital Territory (FCT), with the Commission’s Chairman, Prof Mahmood Yakubu urging them to be firm and courageous on the side of the law at all times. They include Mr Segun Agbaje, Mr. Baba Abba Yusuf, Dr Uthman Abdulrahman Ajidagba, Mr Yahaya Bello, Dr Emmanuel Hart, Mr Mohammed Magaji Ibrahim and Dr Cyril Omorogbe. Both Agbaje and Yusuf were reappointed while the other five are fresh appointees. 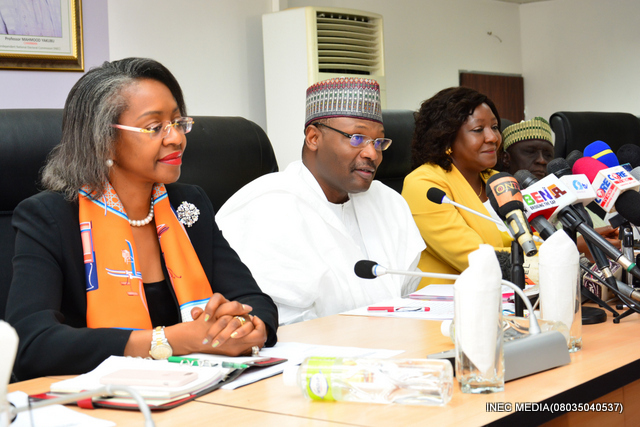 Prof. Yakubu also informed the RECs that as part of its preparations for the next General Elections, the Commission embarked upon the Continuous Voter Registration (CVR) exercise nationwide. His words: “For the first time in the history of our elections, citizens who have attained the age of 18 years and those who could not register before the last General Elections now have the opportunity to do so on a continuous basis as provided for by the Electoral Act. The INEC Chairman noted that the Commission was aware that citizens who registered in the first quarter of this year were anxious to know when they can collect their Permanent Voter Cards (PVCs). 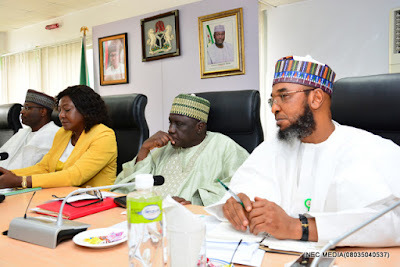 “We have consistently reassured the public,” he averred, “that for those who registered in 2017, their PVCs will be available for collection in the first week of May. Prof. Yakubu also informed the RECs that they would be responsible for the implementation of the Commission’s policies, just as they would exercise supervisory control over personnel, resources, legal and administrative processes in the states to which they are posted. He affirmed that they could be posted to any part of the country at any time as required, but for now, they would be posted to states within their respective geo-political zones. He however asserted that none of the RECs would be posted to his state of origin throughout his tenure. Prof Yakubu further advised the RECs: “As election managers, you must maintain the required openness and consultation. At the same time, you must be very firm and courageous on the side of the law as well as our regulations and guidelines at all times, as required of an unbiased umpire. Speaking on behalf of his colleagues, Agbaje pledged that the new appointees would do all that is required to attain the Commission’s set goals and carry out their assignments with integrity.